With store bought sweets being so prevalent, it’s easy to forget how much tastier homemade candy is. Well we’re here to help you remember, because after one bite of our homemade twix bars, you’ll never buy the packaged stuff again! 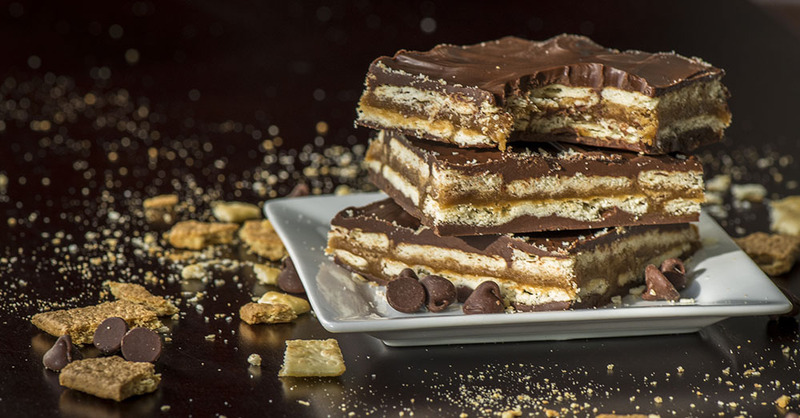 We sandwich club crackers and a rich caramel filling between luscious layers of chocolate, for a chewier bar with a better cookie-caramel-chocolate ratio than the original. We could barely get these gems chopped up before our family devoured them – they really are that good and we know you’ll agree! Line a 9x13-inch baking dish with parchment paper or aluminum foil. In a medium, microwavable bowl, melt 1 1/2 cups chocolate chips in 20-second increments, stirring in between, until completely melted. Pour chocolate into lined baking dish, making sure to spread it into the corners. Place dish in freezer for 20 minutes, or until set. Remove from freezer and form a layer of club crackers over the set chocolate. In a different saucepan, combine crushed graham crackers, dark sugar, regular sugar, butter, milk and vanilla extract, and stir together. Bring mixture to a boil, stirring constantly, and cook for 5 minutes, or until thick and smooth. Remove from heat and pour caramel evenly over club crackers. Carefully form another layer of club crackers over the caramel, gently pressing the crackers into the caramel so they adhere. Refrigerate bars for 15 minutes, or until caramel is just set. Place remaining chocolate chips in microwavable bowl and microwave at 20-second increments, stirring in between, until completely melted. Pour chocolate over club crackers and smooth over the top. Refrigerate 20 minutes, then cut into squares. (Don’t wait too long or caramel will be too hard to cut). Recipe adapted from Jamie Cooks It Up!